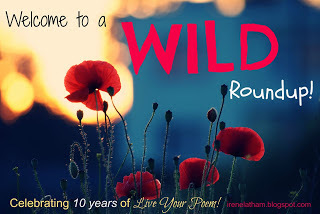 Tomorrow, writer, Irene Latham is celebrating her 10th anniversary as a blogger at Live Your Poem... Bloggers will be posting on a theme close to Irene's heart, WILD, and she will be rounding up the links during the day so that everyone can "go wild." I can't wait to read all the approaches bloggers have taken. Congratulations to Irene on a decade of posts! Rather than compete with the master, I wrote a small poem that incorporated both Issa's idea and the one that I tried to get across with my haiku. I took the determination idea and worked the wild in. Determination will only take you so far when faced with elements out of your direct control, for example, the weather, the tides, or a kid with a plastic pail. When one gives up thought of control, who knows what adventures will ensue? A rather Dickinsonesque poem, don't you think? Update: it is now 9:00 pm, and Irene's wild link-up has begun! Check it out! Thanks, Andy. That little periwinkle's path was even longer than the photo shows. Amazing. Diane: I LOVE THIS. The wild abandon of winkle tenacity.... makes my heart beat wildly for sure! thank you for making this your own -- and for sharing it. Beautiful!! Thanks, Irene, for all your years of blogging, and for providing me with the wild challenge! If you hum to a periwinkle, it's supposed to come out of its shell. I've found myself humming to snails on a number of occasions! Why, I believe I've met that winkle! You may have! Do you live close to Ogunquit? I somehow imagine the periwinkles of T & T are brighter in color then the ones up here--ours are a uniform gray-brown. You'd need a lot of winkles to make a bottle's worth! Love this, Diane! I immediately thought Emily Dickinson and then got to your line about that, too. "When one gives up thought of control, who knows what adventures will ensue?" So true. So difficult, but so true. Thanks for this wonderful poem. Thanks, Laura. Every once in a while, I'm bitten by the Emily bug. 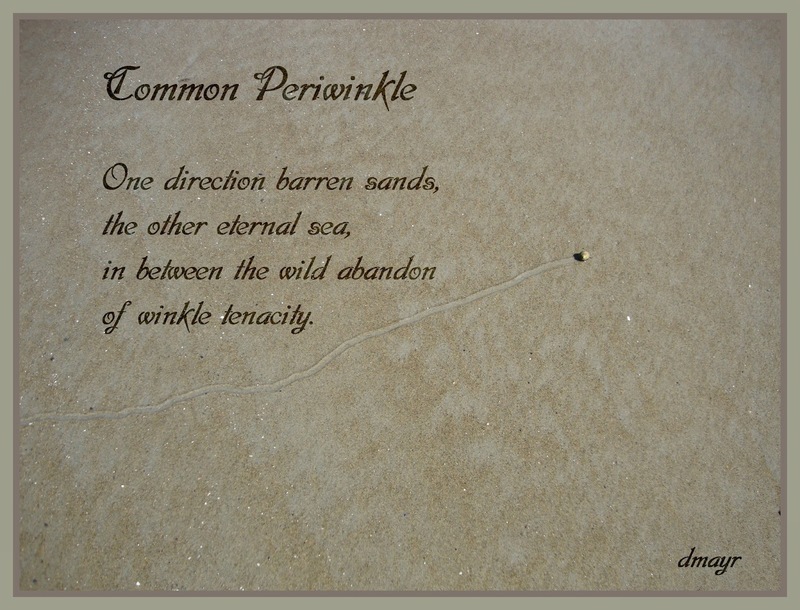 Winkle tenacity -- sublime. Wonderful poem, Diane!! Thanks, Jama! Glad you like it. I bet, given the challenge of Mt. Fuji, the Maine snail would have made it to the top! This trail detected is a sweeping wide world photograph for the winkle and such a small space for us. The dichotomy you've captured is good to ponder. And "winkle tenacity" is a smooth-going phrase if there ever was one. Thanks, Jan! I was struck by how far the little thing had gone without being washed away by a wave. It was probably the equivalent of a ten mile walk for me! I wonder where he is right now? Perhaps he feels like Sisyphus, what with the tides every 6 hours? Thia is awesome! Giving up control is truly wild and liberating. Great post! 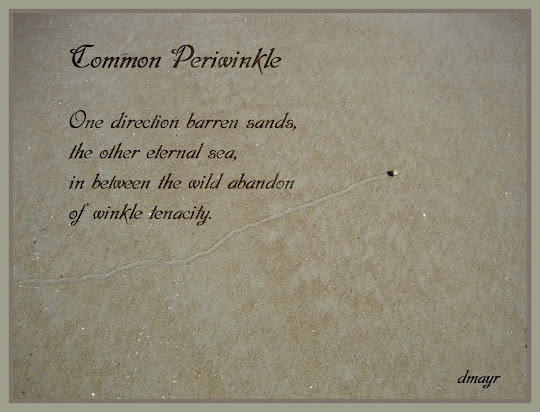 I love the periwinkle trail haiku and the rhythm of your haiga. Wonderful poem and photo combination.